The most commonly performed clinical trials (medical studies) evaluate new drugs, medical devices, biologics, or other interventions to patients. You can use Google Base to help medical institutes find new treatments for brain tumor, breast cancer, breast neoplasms, cancer, cardiovascular diseases, HIV infections, leukemia, lymphoma or osteoporosis. You can also select the organization that is responsible for the clinical trial. 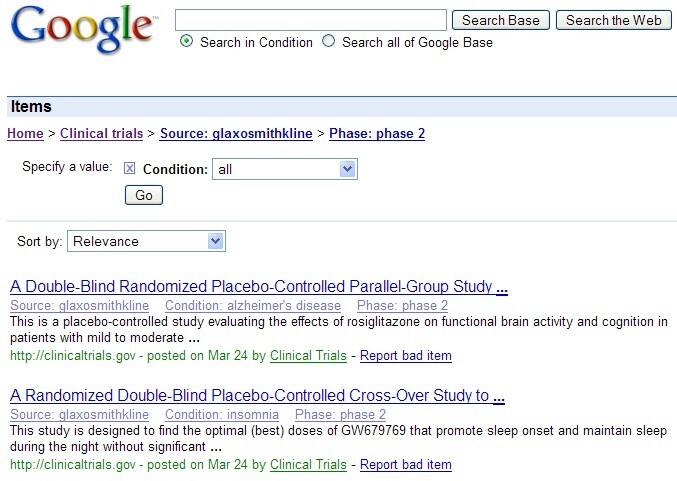 The Google Base clinical trial search is interesting. 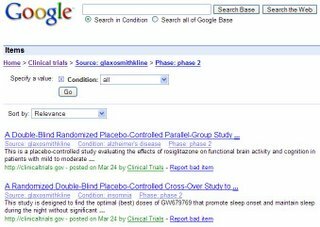 However, it seems that ClinicalTrials.gov yields more results and offers many more search options including synonym search. Also, I can't seem to find any info on the Google site how often the info is updated. The government site, where the Google info comes from, also allows you to limit to trials by date added.